504 Main by Holly Lefevre: There Are Bloggers Under My Tree! I love to shop...no really I LOVE to shop! Usually by this time of the year, my presents are all purchased. Well, not this year becasue I have deciced to go a different route for many of the gifts. I am actually making many items or looking for little treasures here and there. I have enough plastic and things that go beep (did I mention that the Nintendo DS that I swore to my hubby was a good idea, that was/is, admittedly, my worst idea EVER!...Well, almost ever!). OK, there will be some Legos and probably a Barbie but for the most part, I on am on a mission to be creative and supportive of local artists and merchants....and let me tell you I have found some of the best things from my Blog Friends!...and I just HAVE to share them with you! This is my Christmas apron! Now, when the Queen speaks you cannot say no, right! Lee makes these fantastic soaps and I figured they were the perfect gift. So, with a few clicks, they are mine...soon to be someone else's! Cute, eh? You can get them totally personalized! Go check out Lah Dee Dah Soaps...it is not too late to order! As much as I love to shop, I am not good at shopping for other people. But one of the people I do OK for is my ex-step-mother-in-law. From Iris, I found this amazing necklace. She makes really beautiful jewelry and you should go check out her esty shop too! This trio of leaves is on my wish list...the other is the gift! So this is off on a tangent, but can you believe what a small world this is...I only know Iris through the blog world and Iris knows the people who used to live in my house! She has been to my house...before it was mine...I am still trippin' out on that one! OK, go check her out! I am not done with my shopping yet! Is there another blogger I should check out? I love it!! Thanks babe!! I don't have them yet (just ordered will have them next week) and I can't wait. They look so cute. I had thought about buying from other bloggers who sell things. I may still do that. Thanks for the reminder! I wanted to get some of those soaps from Lee! Good post! I need to go and check some of these out! THanks! Great idea! I love spending Ward's money ;) and Etsy is the best! I love that you shopped with bloggers! Awesome! 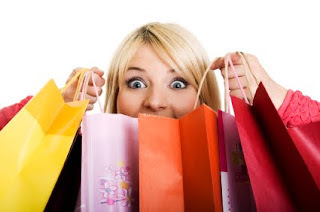 That is so fantastic that you did some of your shopping with fellow bloggers! Love it! 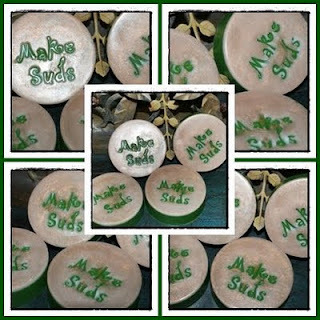 I saw those soaps of Lees, they are fabulous and I love anything that can be personalized. The apron is cute too, too bad I don't cook much! That's a lot of fun! I may do that next year. I just went and ordered some stuff on Amazon. It's online, but more like Walmart than a mom and pop store. That's great Holly! Thanks for adding a link to my shop! And those soaps are too cute!! Great idea! And you put Lee's soaps on there, too! I love the necklaces! Great ideas! Great gifts! Check out under my friends list on my blog, Gadora W. It is my friend Stephanie and she does the greatest little animal watercolors of your best furry friend! She is amazing and they are great gifts for pet lovers! She also does refinishing of old furniture, but her pet portraits are my favorite! Any little girl would be thrilled to receive one of these...she will even personalize it and put their name on the back. I've given several as gifts and everyone has loved them! I've been shopping on Etsy too! Fab place and I always love giving unique one of a kind gifts! No better place than Etsy - especially since I haven't the time to make anything myself this year! If you check my blog tomorrow, there will be an award for you! I love the soaps(and Lee) and the aprons too! What great finds. and this would be why you are a GREAT blogger!!! You share the love and support them! Oh I love this idea! I'm starting to panic about the amount of shopping I have to do! I love Etsy! I have a little shop there, but it's empty right now. Thanks so much for stopping by my blog! I love your ideas for Christmas gifts...I'll have to check some of these out! HOLLY! Thank you! I needed to stumble upon this today. I was hitting a point of exasperation trying to figure out a few more gifts and I love the soaps and aprons. Perfect. I've got the same shopping list this year. I'm buying locally and supporting handmade art ~ gotta love Etsy! I'm almost finished but need a few fillers. I'm off to check out your suggestions. If you're in the need of a cute tassel, I know just the Esty shop ;) My Christmas items will be listed late Sunday and Monday since I have a show tomorrow. I LOVE her soap! It smell so good doesn't it. Um... loooooovvvvvvvvveeee the aprons. 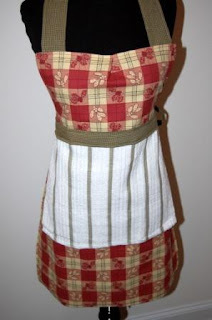 I love aprons, how cute! And now, there are more awards, too. That apron is adorable! I love etsy. The apron is darling! I have not spent much time digging around Etsy...must do this. Thanks for the idea. How in the world did I miss this. Thanks for putting this info out there. I am checking it out!!! Look forward to checking them out! Loving that apron! I can't believe you had time to put all this together--what a great idea! Thanks for your sweet blog love the other day!! Sorry it took me so long to get back to you- my man took over my computer and I just now took it back!! YEAH! I love your fun blog and I'm bookmarking ya right now girl! The vast majority of my gifts are purchased from the boutiques of my Etsy readers. I am all for supporting creativity. And yes, my daughter too, is getting a Barbie. Looks great and so nice of you to make such great shout outs! Love it. Stopping by from SITS. I bought my soap already from Lee, I got a scarf from an auction on Supah Mommy's website. I going to go to Life, Laugh, Latte to buy gifts made from ladies in underprivileged cultures, so they can get some money. Holly, I love the way you're using your creativity to make a handcrafted Christmas! And it's wonderful the way you're supporting fellow bloggers. They're a talented bunch of ladies!